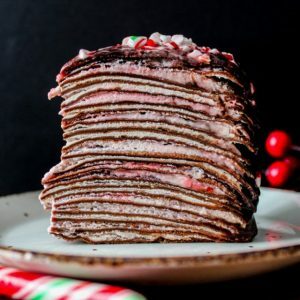 Impress your guests this holiday with a unique looking Candy Cane Chocolate Crepe Cake with a chewy soft texture, candy canes to give it a nice satisfying crunchy sweetness topped with a dark chocolate ganache. 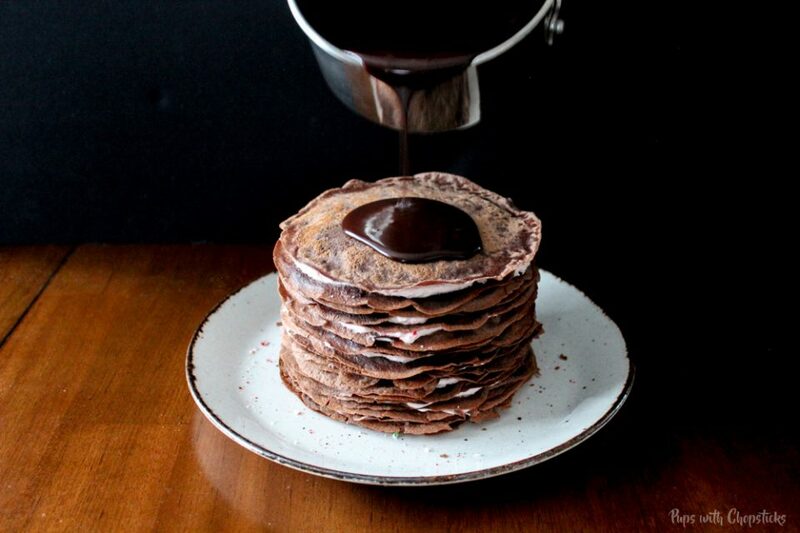 This chocolate crepe cake is quite versatile. You can pour the chocolate over the chocolate crepe cake at the very end like a frosting (like I did) or you can spread it onto each layer, along with the cream and candy cakes to give it a more rustic raw look as well. Keep in mind though, you will have extra chocolate sauce – I like to eat it with a spoon. 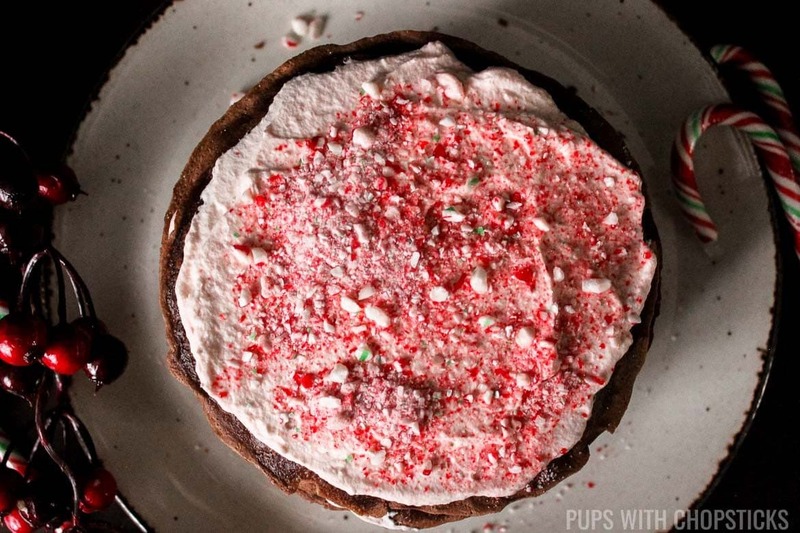 This chocolate crepe cake is also not limited to just candy canes and chocolate. Be creative with it! I have made a lemon sugar crepe with this exact recipe. I substituted lemon zest and sugar for the candy cakes and omitted the chocolate and it was delicious and light! There are 3 sections of ingredients for this cake: the crepe ingredients, the cream filling ingredients and the frosting ingredients. I made eggnog an optional ingredient for the frosting and for the crepe. You can substitute it heavy cream for the frosting or milk for the crepe. It actually doesn’t alter the flavour and consistency at all. Option 1 : Milk – Use 3/4 cup of milk with 1/2 cup of water. 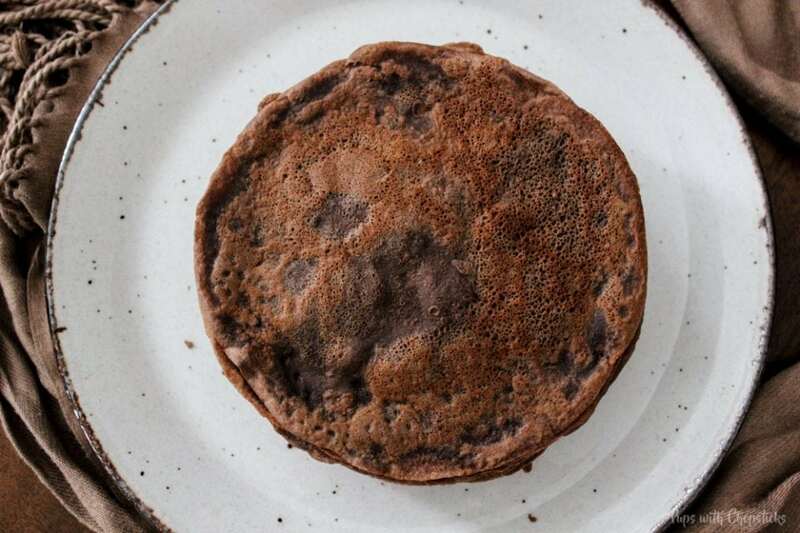 To make the chocolate crepes, I used a small non-stick frying pan and swirled 1/4 cup of batter around in a thin circle and let it cook for about 1-2 mins a side. I opted for a smaller pan to make a taller crepe cake, but you can use a larger pan if you want a larger (but shorter) crepe cake. You will know the crepe is done when the edges look like they are about to dry out and curl. I won’t lie, making crepes will be the most tedious and longest part of the whole process of this cake – stick with it. It’s worth it. For the whipping cream filling, I kept it simple. For the sugar filling, it’s just plain ol’ candy canes. 🙂 Unwrap the candies and pulse it in a food processor. Pulse the candy cane for a more grittier and chunkier texture for some crunch in the cake, else it becomes too fine and powdery. This step is quite easy. 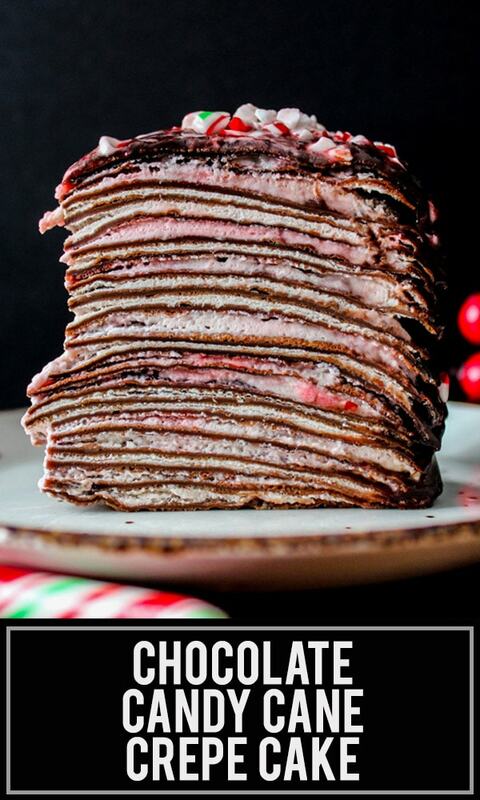 Just stack layers of chocolate crepe, cream and candy cane! 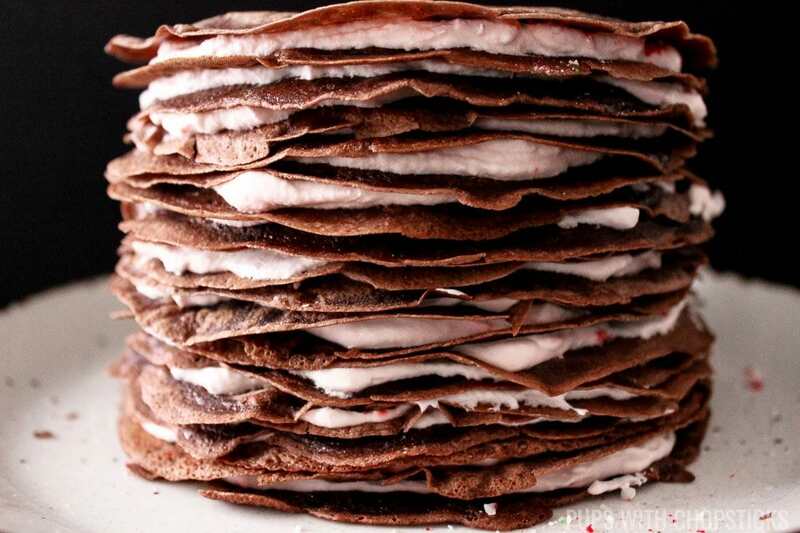 I stacked the layers in this order: crepe, cream, crushed candy canes – repeat until done! 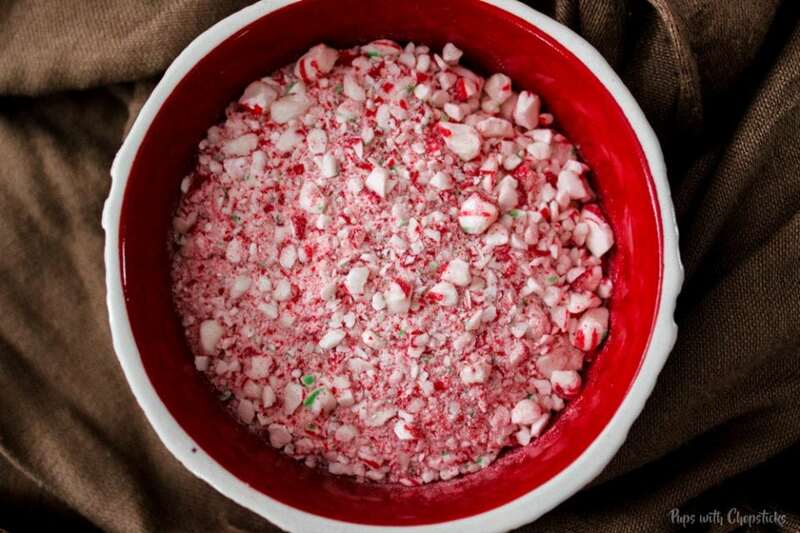 There is no rule for how much candy cane you want to sprinkle on. 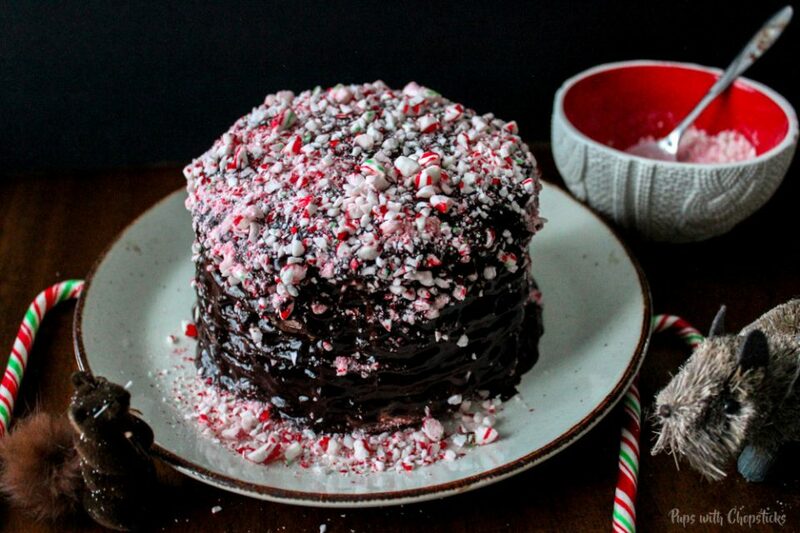 If you like a sweeter cake, then you can put candy cane on every layer, if you are like me and prefer a less sweet cake then layer on the candy cane every other layer or every 3 layers. See how pretty it looks? 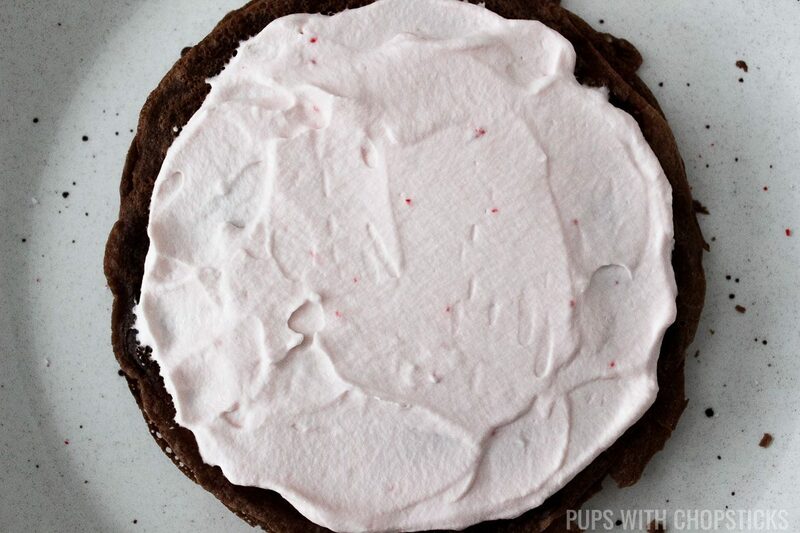 Honestly, you can even serve it as it is without the dark chocolate frosting if you like! In a small pot, heat up the cream until it is hot but not boiling. 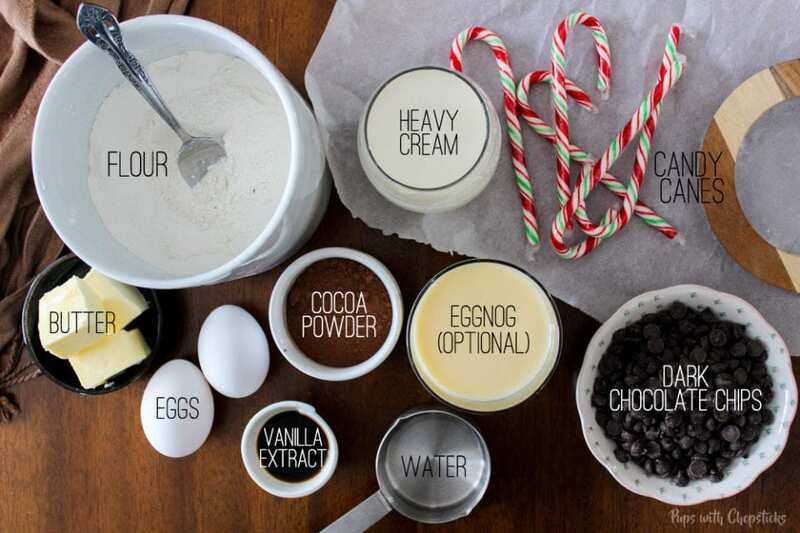 Turn off the heat, and pour in the chocolate chips and stir! 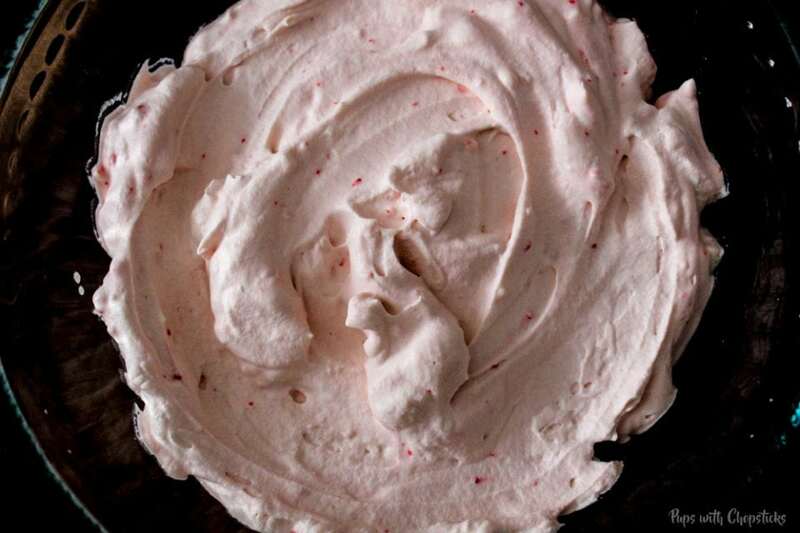 If you find the frosting still clumpy, you can turn on the stove on low and keep stirring it until it is smooth. Let the chocolate ganache cool a bit before you pour it on the chocolate crepe cake! Don’t worry if the sides of the cake are not fully covered by just pouring the ganache over the cake, so you will need to take spoon to ladle it onto the sides. Put the crepe cake in the fridge to set before transferring it to another plate or adding toppings on it. …and voila! 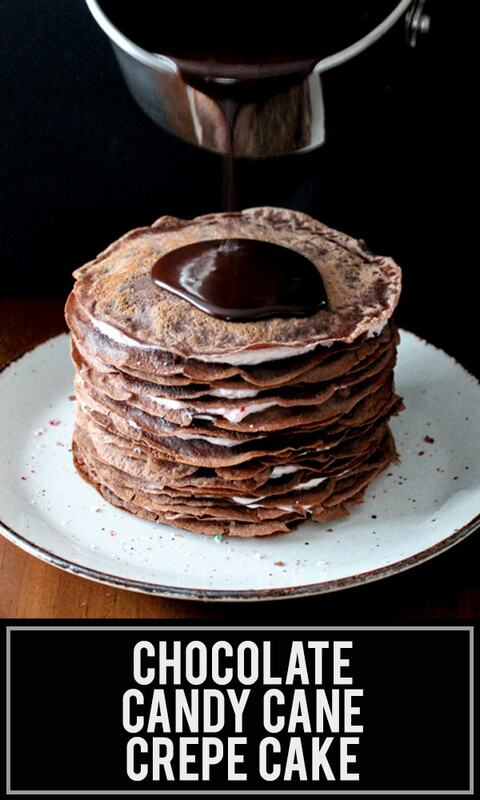 A interesting looking chocolate candy cake crepe cake that tastes very chocolatey and minty! Perfect for the holiday seasons and if you decide to make this for parties and family gatherings, your guest will be very impressed well because…it kinda looks fascinating with all the layers! 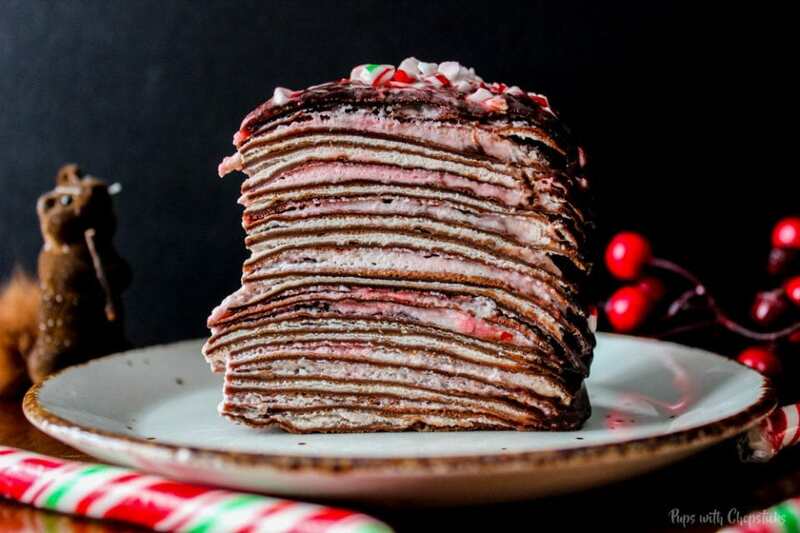 Impress your guests this holiday with a unique looking crepe cake with a chewy soft texture, candy canes to give it a nice satisfying crunchy sweetness topped with a dark chocolate ganache. Combine all the crepe ingredients and mix until smooth. It should be a thin pancake consistency. If it’s not, add some water or milk. In a small non-stick frying pan, add a little butter and adjust the stove to low heat. Remove from pan and set it aside to let it cool. In a small pan, heat up the heavy cream until hot. Careful not to let it boil. Pour over the cooled cake. You may have to ladle some of the chocolate manually to cover the sides. What a great idea! You could just take this recipe and go wild with variations. Love it! What a beautiful looking cake. This would be a great alternative to the usual stodgy Christmas cakes. This looks very impressive!! I have never tried a crepe cake before but I think I need to! Definitely try it out, it’s a lot easier than it seems! 🙂 Just takes a bit of time to make all the crepes. Oh wow! I’ve always thought of crepes as a breakfast dish, but you just elevated it to dessert! What a beautiful and unique presentation. This cake looks amazing!! I’ve always wanted to make a mille crepe cake, but was a bit intimidated by how complicated most recipes are. Your recipe is so easy to follow and the steps are laid out so clearly that I feel totally comfortable making this! Great job! Love the use of the candy canes. So creative! Can’t wait to try this. So Christmasy! The layers looks so impressive, but now that I know how to make it, I have to give it a try! AMAZING creation of cake that mix with dark chocolate plus,…. , especially adding Christmas candy sticks crash into fine tiny pieces that would make the whole cake very Christmasy,. Since Christmas is only weeks away, I will nake one to entertain my friends. Tell you the true, I am a dark chocolate lover. By the way, you made very clear instructions through the whole making cake process. I love dark chocolate as well! Not to sweet and very decadent.